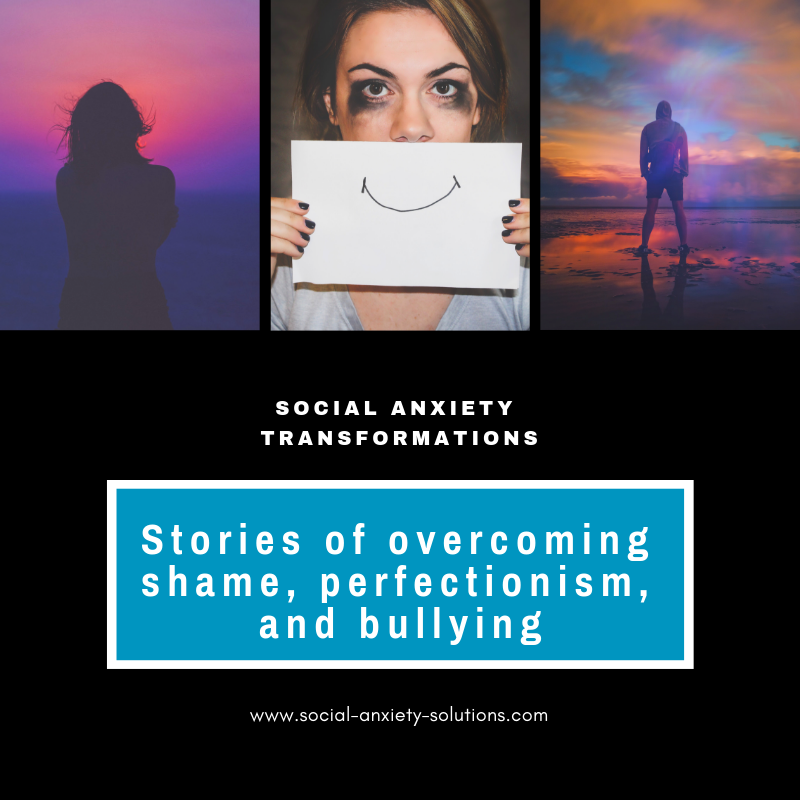 Looking for some inspiration for what is possible to overcome your social anxiety? We’re taking a look back at transformation stories shared by expert guests. Emma Roberts: Well, one girl I can think of who actually had suffered from extreme, extreme ritualistic sexual abuse, but that wasn’t what she came with. She came with weight loss. Although she did but it wasn’t her repressed memory, it wasn’t hidden away from her conscious. She was perfectly aware of what had happened. But she was in essence, she was hiding from the world. She was piling on weight getting bigger and bigger and it was really interesting. She wasn’t really eating very much. She was constantly on a diet, but it was having the total reverse effect and it was like her own posture and everything, she had a stutter. But her stutter only happened when she tried to say her name, what’s so interesting. She could have a completely normal conversation like you and I are now but every soft she referred to herself in the third person and then she couldn’t say her name. It was really extraordinary. And anyway, she was basically hiding from something, practically she wasn’t acrophobic, but she might as well have been. She wasn’t really going out much, didn’t socialize, she was embarrassed to the core shame to the core herself about something. Actually, that shame did not belong with her and it took a persistent and thorough working through things over a long period of time. Well, I say that in the work that I do that’s not long and compressed and psychotherapeutic work but it took about, I don’t know, maybe about six months of weekly sessions during which time the weight could actually began to go, but more to the point it was like she kind of emerged and she emerged as herself and she had found her voice, she could say her name and she started going out. And this was kind of incidental. We weren’t really focusing on it, but it was happening at the same time which I found really fascinating. And at the end of the day as far as I’m aware I know she got married and saw somewhere it’s not the anxiety about being out there in the world and people seeing her, that stuff is gone, it hasn’t returned. I’m sure she did come back. Last I heard she was getting married. Emma Roberts: Yeah, that’s great. And she was amazing. Sebastiaan: Yeah, it’s often that you hear that people have gone through that suffer for the rest of their lives and never really overcome it. Emma Roberts: I think the difference here was that she really, really wanted a life. She really wanted a life. And I know a lot of people say they do but often there’s something unconscious it’s kind of blocking that, but she was really brave, and I remember she did a lot of work on herself between sessions. It was her commitment that got her to the change. Even I know there were some really difficult times. It’s not a straight path this stuff and it’s very challenging. Emma Roberts: And really scary, pretty scary sometimes. 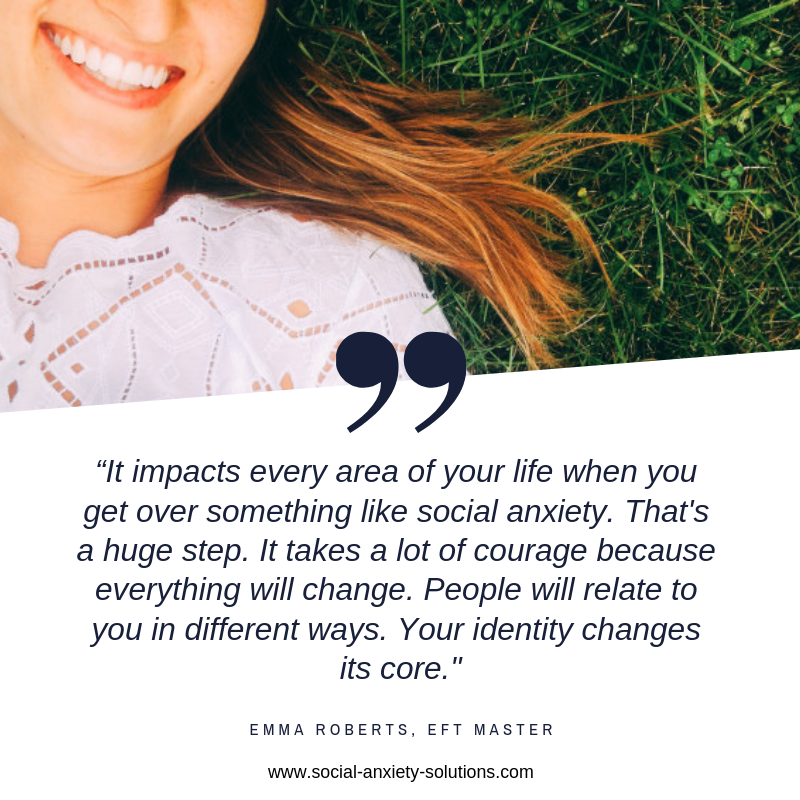 And I think anybody who even begins to embark on this on the path of change like this and this is a massive change because it impacts every area of your life when you get over something like social anxiety. That’s a huge step. It takes a lot of courage because everything will change. People will relate to you in different ways. Everything will change. Your identity changes its core. Carol Look: The first thing to know that is inspiring for people is not everybody has it which means you got it somewhere. You learned it somewhere which means you can unlearn it. Which is very, very important to know because when people have it, when they have the anxiety it’s almost like a phobic response. They think they’re stuck with it forever and you’re not. You’re not at all stuck with it forever but you had to be trained that socializing was dangerous, unsafe or scary or else you wouldn’t have this reaction to it. So, that’s the good news. I know it feels like the bad news but that’s the good news. So, there was one client in particular that I loved talking about. She grew up with several brothers’ older brothers and her father who teased her about everything. So, she’d opened her mouth and say something, and they would tease her and anything she said they criticized or teased her so then when she was at work when the group was bigger than two people, she couldn’t do it. And at work they would have parties and they would have monthly get-togethers and bonding exercises with the boss and everybody and she barely could walk in the room she was so scared of it because her expectation was, she would be humiliated. And the thought of that triggered her anxiety and the adrenaline that happens in the phobic response and then her desire to stay home. That’s how it goes. You have to have a thought and a picture that it’s going to be dangerous in order to make you get scared, have the cortisol and adrenaline race through your body and then make decisions like I need to avoid a social setting. Carol Look: It was just really fun to help her with that because then what happened is, she could start to stand up to her older brothers now they’re adults, right? Carol Look: She could start to stand up to them and start to understand it wasn’t about her. This did not mean she was worth humiliating this just meant that’s what they wanted to do. Then she didn’t perceive everybody in her life the boss and the colleagues and social settings when she wanted to go out and be with her friends. She didn’t expect them to have the same desire to criticize her so that started to lower her anxiety. When she could start to put it into perspective, and we did energy therapy with her everything changed because she unraveled the past part that was what taught her how to do it and then she could deal with the present and deal with the future anxiety. It was a lot of fun because it helped her personally and professionally. People call it social anxiety but if you work at an office it’s professional, but it still feels like social anxiety like going to a party or going to some kind of gathering with people. It’s not just a work. Carol Look: I love that story because it was… Yeah, exactly. Sebastiaan: And what happened with the relationship with her brother’s? I reckon that changed as well or…? Carol Look: Yes, that changed a lot. They didn’t like it because she was the baby sister. Carol Look: But she stood up to them and said, “Yeah, I’m not going to take that anymore because I don’t deserve it and go pick on someone else”. And it would definitely rock the boat, but she just came out of her shell and she started to realize very quickly she had a lot to offer and her assumption was that she didn’t have anything to offer. Sebastiaan: The insecurity from the teasing from her brothers and from her dad was no longer there and as a result she felt stronger. Carol Look: Stronger and equal. 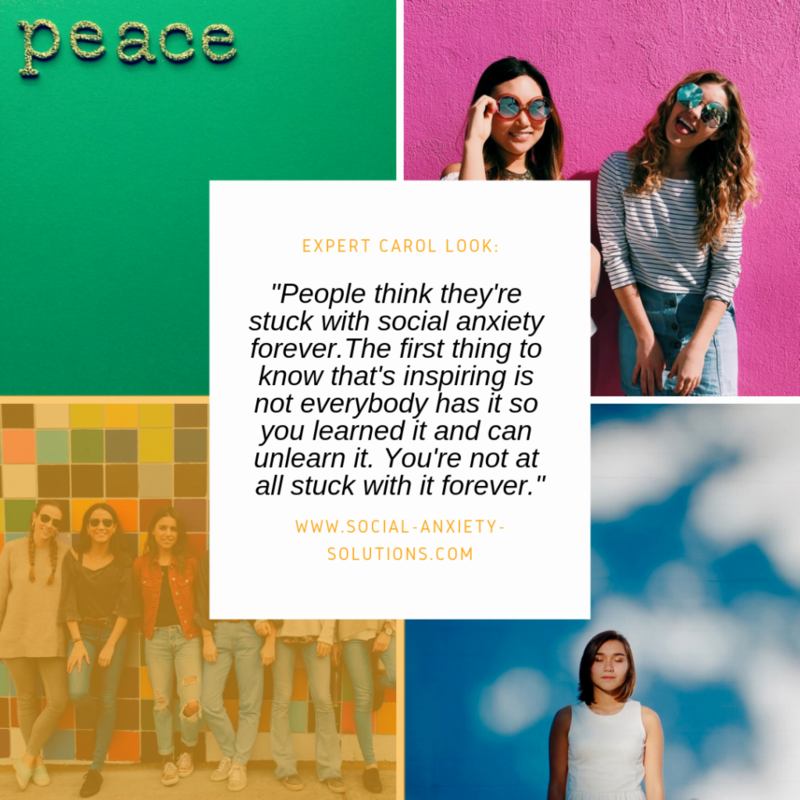 Carol Look: Someone who feels socially anxious feels like they’re less than and that’s why someone would pick on them or humiliate them or judge them or criticize them. She just said I’m one of the gang. I don’t care if it’s at work or with my friends at a bar I am one of them. Nobody’s perfect. So, it was just incredibly helpful and fun to watch because it’s such a freeing thing when someone has helped that way. It’s just so exciting, their life changes, you know that. Their whole life changes. Tania Prince: Well, I was thinking about this obviously and you’d want a story, so I was thinking one of the ones that really came to mind for me it’s actually one of my trainees. Someone who attended my training course and wanted to become a therapist and she’s most fascinating lady because she’d been a teacher. And she came on the training course and you could feel her tension. You could feel it and she found it very difficult to sit through each training module on the live training course. And at the end of each period of training she would get out the classroom very, very quickly go off and smoke because it was just so uncomfortable for her to sit in that classroom to sit in the lecture room. She actually was brave enough to volunteer to let me work on her and I did work on a right in front of everyone. It turned out that when she’d been at school one of the lecturers had continually asked her questions. He’d asked her to give the answer. He always picking her out in the classroom day-in day-out and she would get the answers wrong. And she almost felt like she was being bullied or intimidated in that session. As if he was deliberately picking on her on setting her up to fail and so it left her with this incredible tension and this discomfort because of course, that situations happening with everyone’s eyes, everyone looking at her. It is happening in a social situation. She’s going into the classroom feeling this absolute tension, she comes into my training and she’s got all those triggers in place of people looking at her being the center of attention and she is feeling this extreme discomfort. We actually used the EFT tapping with her and we cleared the trauma of that, and I think she had a huge realization. She realized he wasn’t even attempting to do what she thought he’d been doing. She thought he was setting her up to fail. What she realized in that session, what she hadn’t been able to see as a child was that she was the good kid in the class. The others were wild. I think he saw her as that one good kid that maybe would help him get a bit of credibility in that class, so he’d ask her the questions. As a child she’d not seen it that way but as an adult she got that perception and it just didn’t feel personal anymore. It didn’t feel like some attack on her. It was a big shift for her. She felt totally different, far more comfortable. You see her become far, far more relaxed and what shifting that made a huge difference to her. And I think after that I did question her about the social kind of anxiety problem that she had because obviously she’d been a teacher. She had this most huge elaborate strategies to get through her job. She was a fascinating woman. She told me that on the first day of turn because she knew it was so uncomfortable going into the class with the kids, on the first day of meeting them for the first time she’d go in with a stack of books and almost deliberately dropped them to break the ice with the kids so they’d all start laughing and it breaks the ice. She had all these strategies set up to enable her to handle a very difficult career if you’ve got that problem. This one is so fascinating a big difference because she’s coming out being far more confident and she got, and she went off and became a therapist. Sebastiaan: Wow, amazing. There was this trauma that she had with the teacher and as you did the EFT tapping with her the emotions were released and as a result, she kind of had a cognitive shift a different understanding of what happened which all-in-all made her feel more confident and more relaxed in her job. Tania Prince: Yeah, yeah absolutely because she wasn’t teaching at that point. She kind of retired from that one but she wanted a new career. But as we tapped what happens is you have a trauma that you experience and she had many, many repeated traumas when she has been young so it’s like day in day out, she was going into that classroom and that was her meeting with this constant stress. You get locked into that trauma that you can only see the events in a certain way. She saw it as him trying to have a go at her and set her up for failure and she was locked into that way of thinking about that. When we did the EFT tapping that way of looking at it just naturally shifted and she saw the bigger picture of what she hadn’t been able to see as a child that he was in this difficult situation with a very unruly bunch of kids in the class and she was the good kid and he was trying it in a way to do his job, he was trying to teach properly so therefore asking her the questions thinking she was probably the only one who was going to answer and would be the well-behaved kid. When she got that it didn’t feel personal, it didn’t feel like she was being attacked by him and she became very much reflect about it. And that’s the difference often when you have a situation like that it feels as if someone’s deliberately having a go at you is it been deliberately attacking you and who you are. And she shifted, it’s not personal and that is so freeing to know that, to feel that. That’s what happens for her. Sebastiaan: Right, because these feelings as you say they get stuck and then these feelings in your day-to-day life they get triggered. Tania Prince: Yeah. And the common trigger of course for this kind of issue is people looking at you, eyes on you which is of course what happened in the situation where the original trauma happened. All the other kids were looking at her, the teacher was looking at her so then she goes into lots of different situations in life. Well, people are always looking at something, it’s a trigger so it becomes quite she is the center of attention. When people are looking at you and the expectation for you to come up with an answer that was triggering her. Sebastiaan: Yeah, boom. All the feelings back from back then. Sebastiaan: Have you worked with people who dealt with bullying as well? Tania Prince: Oh, yes. I found a lot of people come to me with different degrees of bullying that they’ve experienced and said. Again, if you’re looking at what happened to her she would have perceived that as bullying. In fact, she did perceive it as bullying that he was bullying her. In a way she was still held in the grip of what she has seen to be as being bullied. I work with a lot of people for bullying. I really absolutely love freeing people from the grip of that. Previous post Inner peace. Care to have some? Next post What if I Don’t Know What Caused My Social Anxiety?